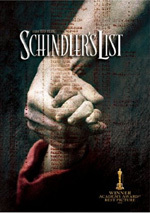 True story dealing with the Nazi war crimes trials of several members of the German judiciary. Here the focus is on two particular individuals, the judge who must render a final opinion and one particular defendant, a well respected German scholar. the defendant, played by Burt Lancaster, must come to grips with the reality of his actions or inaction. Most history books provide little information about the Nuremberg trials. These started in October 1945 and lasted until the summer of 1946 in Nuremberg, a symbolic choice since it had hosted many successful Nazi rallies. Representatives of the four main Allied powers (the United States, England, the Soviet Union and France) tried 21 Nazi officials, and in October 1946, 11 of these Germans were put to death by hanging. More trials followed in later years, but none would take on subjects as famous as those judged in the first session; Nazi bigwigs like Hermann Goering, Albert Speer, and Rudolf Hess were present at that time. Although I’ve always been interested in World War II history, I knew little about the trials, mainly because the books I’ve read didn’t offer much coverage of them. In Martin Gilbert’s splendid The Second World War: A Complete History, he only devotes a few paragraphs of the 846-page tome to these trials. During 1249 pages of William Shirer’s seminal The Rise and Fall of the Third Reich, the events get a little more attention; Shirer fills two full pages with notes. I don’t mention the brevity of these comments to slight the writers, really, as their works are absolutely terrific; Rise and Fall remains one of the most compelling books I’ve ever read. However, I did want to remark upon the paucity of printed material available about the Nuremberg trials. Surprisingly, those events have proved a bit more popular with filmmakers. In addition to a few documentaries, the trials have inspired two movie adaptations. The initial attempt to gain justice in 1945 and 1946 was the subject of a 2000 cable miniseries called Nuremberg. For an examination of the subsequent trials, we go back to 1961’s Oscar-nominated Judgment at Nuremberg. Set in 1948, we see the arrival of American Judge Dan Haywood (Spencer Tracy). As noted, the tribunal’s already gotten through the more prominent Nazis, so they now deal with justice for lower level collaborators and civilians. Haywood presides over the trial of four German judges who legalized Nazi atrocities: Emil Hahn (Werner Kemperer), Friedrich Hoffstetter (Martin Brandt), Werner Lammpe (Torben Meyer), and Ernst Janning (Burt Lancaster). All four plead “not guilty”, though Janning relates through his counsel that he doesn’t recognize the authority of the court. We meet the head of the prosecution, American Colonel Tad Lawson (Richard Widmark), and defense attorney Hans Rolfe (Maximilian Schell). Lawson holds the judges responsible for the abuses that they helped legitimize, while Rolfe defends them on the grounds that they simply carried out the laws but didn’t make them. We learn how the judges had to turn into rubber stamps under Hitler, and how they authorized the increased use of death penalty as well as sexual sterilization. 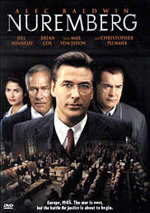 The movie mostly follows the trial, as the two sides duke it out, but we also see some material outside of the courtroom. Haywood stays in the house of Madame Bertholt (Marlene Dietrich), who’s now displaced. Haywood meets her when she stops by to get some things, and he chats with the house staff to get a better feel for what it was like to live under the Nazis. While much of the film remains in the courtroom, we also see Haywood’s explorations of German culture and his global attempt to understand what happened under the Nazis. As I expressed when I first reviewed Das Boot, I feel somewhat uneasy with projects that depict Nazis in sympathetic ways. I don’t say this because I think that every Nazi was one-size-fits-all evil, but I do think a certain level of malevolence infected everyone who cooperated with the Third Reich’s schemes. Because of that, I don’t feel terribly comfortable with examinations of the Germans that might seem to let them off the hook. On the other hand, I understand that the participants bought into things to varying degrees. Some went along gleefully with Hitler’s concepts, while others claimed to simply do what they were told. Others actively despised the policies but cooperated because they couldn’t do anything else to survive. It’s easy for us to say that we wouldn’t do the same, that when confronted with obvious evil we would stand up for what we see as right. However, few of us ever went through that form of test so we can’t truly say what we would do. When faced with our own extermination and/or the deaths of those close to us, it’s tough to be sure what we would do. Those concepts fall behind the point of view expressed in Judgment. It walks a fine line between sympathy for some of the former Nazis and absolute condemnation of them. The movie strives hard to portray positive aspects of the German society but also to let us see the horrors as well. One minute we might watch Judge Haywood as he enjoys the German culture, while in the next, we examine graphic footage from the concentration camps. This movement from positive to negative could render Judgment as wishy-washy and inconsistent, but it doesn’t. Instead, it lends the flick a tone of depth that most films of this sort lack. It gives us Haywood’s point of view well. As he opens himself to try to understand how the Germans could have done what they did, we get all the different elements as well. Those parts work partially due to the even-tempered presence of Tracy. The entire cast performs well, but he really helps ground the piece. He makes the judge open-minded and fair but never dithering or indecisive. Not everything about Judgment flies. To avoid spoilers, I won’t go into the details, but one scene moderately late in the film ties things up a little too neatly and removes some of the moral ambiguity that I liked so much. The movie still makes excellent points, but the scene in question renders the dilemmas a little more toothless. Judgment at Nuremberg probably could stand some trimming as well, for at more than three hours, it gets a bit logy at times. Nonetheless, the vast majority of the movie succeeds. 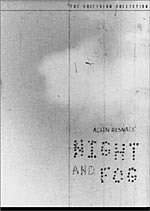 It tells an important story with clarity but without heavy-handed or moralizing techniques, and those allow it to become involving and thought-provoking. 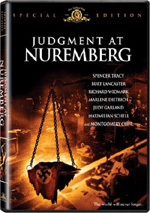 Judgment at Nuremberg appears in an aspect ratio of approximately 1.66:1 on this single-sided, double-layered DVD; the image has not been enhanced for 16X9 televisions. Some studios such as Disney routinely give 1.66:1 flicks anamorphic transfers, but MGM does not. That’s too bad, as Judgment would have benefited from that treatment, but the transfer looked pretty positive anyway. Sharpness largely came across well. A slight amount of softness occasionally crept up in some wider scenes, but those examples remained minor. Overall, the movie looked nicely distinctive and detailed. I saw mild instances of jagged edges and shimmering plus some minor edge enhancement. Print flaws also stayed fairly infrequent. Occasionally I saw some specks and marks, but those created small intrusions at most, as the majority of the flick came across as clean. Grain seems somewhat heavier than usual, though. Blacks were very deep and firm, while low-light shots appeared concise and well-delineated. Judgment wasn’t one of the best transfers of an older property, but it seemed consistently satisfying nonetheless. As for the remixed Dolby Digital 5.1 soundtrack of Judgment at Nuremberg, it presented a mild expansion of the original monaural material. Since the majority of the movie took place in a courtroom, we didn’t get a lot of opportunities for auditory fireworks. Speech presented inconsistent placement. Most of it came from the center, and some clear use of direct localization in the sides also occurred. However, occasionally the lines meant for the middle bled slightly to the other speakers, which made them a little unfocussed. Minor examples of effects from the side speakers popped up throughout the movie. Again, we didn’t get many chances for that kind of material since dialogue remained the main focus of the audio. The spread of the effects didn’t add much to the proceedings, but those elements also failed to distract. In addition, music appeared infrequently during the flick, so it didn’t make much of an impact either. The score showed minor stereo spread but not great definition. The surrounds played an even more minor part, as they lightly accentuated some aspects of the forward mix and that was about it. For a flick from 1961, the quality of the audio seemed acceptable. Speech was a little muddy but remained intelligible and lacked edginess, so the lines appeared era-appropriate. Effects could be a little boomy for the smattering of louder bits, but those elements generally seemed reasonably clear and accurate. Music fell in a similar category; the score didn’t show much life, but it seemed fairly well-rendered given its age. The score occasionally strained and became a little distorted, but not frequently. Ultimately, the audio of Judgment didn’t greatly impress, but it was fine in regard to its era. A mix of extras round out the DVD. In Conversation: Abby Mann and Maximilian Schell lasts 19 minutes and 37 seconds as it presents what the title implies: a chat between the writer and the actor. We learn a little about the origins of the project and the context of its era, German reactions, the original TV version and Schell’s decision to take the role, reflections on his career, and various anecdotes. A lot of mutual praise makes this program tough to get through at times, but it includes a reasonable amount of useful information. It’s not a great piece but it has some merit. A featurette called The Value of a Single Human Being fills six minutes and two seconds. It offers comments from Mann as he gets into his motivations for writing the piece and its connection to the McCarthy era as well as the present day. It’s a fairly engaging and thought-provoking little chat. Next we find A Tribute to Stanley Kramer. It goes for 14 minutes, 25 seconds as we hear from widow Karen Sharpe Kramer, She recounts her early introductions to the director as well as their romance. She also tells us some of Kramer’s motivations related to Judgment. Mann then discusses the Playhouse 90 version of Judgment and the decision to redo it, and both he and the widow get into general recollections of Kramer, especially as connected to the movie. We get a decent feel for the director in this reasonably informative piece. A few minor bits finish the set. The Photo Gallery presents 127 pictures spread across five sections. These mainly offer behind the scenes shots, though we also get a few publicity images and snaps from the premiere. It’s a strong collection. In addition to the film’s trailer, “More Great MGM Releases” shows covers of three semi-related titles. A powerful and concisely told examination of a controversial topic, Judgment at Nuremberg holds up well after more than four decades. With strong acting, good production values and a nicely objective tone, the movie presents its subject with good clarity and depth. The DVD offers pretty positive picture with fairly average audio and a minor complement of supplements. I can’t call Judgment a great DVD, but it’s a fine movie, and especially given its low list price of less than $15, it definitely earns my recommendation.